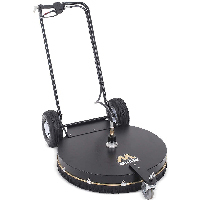 43″ Rotary Surface Cleaner with Handles, Mi-T-M, AW-7020-8001. This high-speed rotary surface cleaner features professional-grade aluminum housing, a trigger gun with two 41⁄2″ nozzles, and pneumatic tires. It is suitable for cleaning decks, patios, sidewalks, driveways, pool decks, and parking lots.